Published of the book "Rafale: The Scam That Shook the Nation" told NDTV, "We have sold all the 8000 copies it had printed. Printing for the second edition of ten thousand copies is underway". 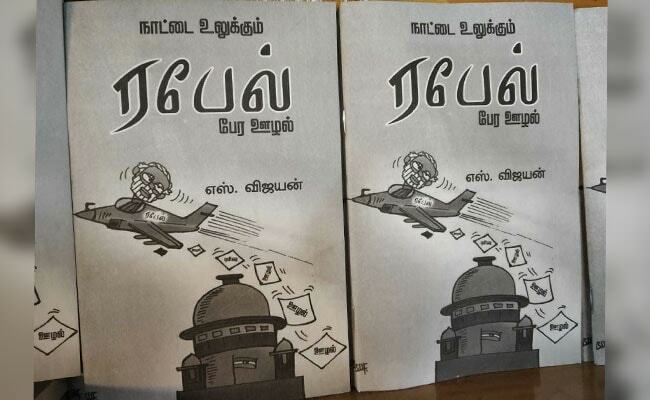 The book on the Rafale deal allegations, that an election commission squad in Chennai seized and attempted to stop its release, has flown off the shelves and reportedly sold all copies. The book was returned a few hours later after being seized and was launched in the evening on its scheduled time. The book has reportedly sold all 8,000 copies and another 10,000 copies are going to be out soon. P K Rajan, Editor of Bharathi Puthagalayam- the store that published the book "Rafale: The Scam That Shook the Nation" told NDTV, "We have sold all the 8000 copies it had printed. Printing for the second edition of ten thousand copies is underway". On Wednesday, around 150 books written by engineer S Vijayan, were taken away by the "poll squad" from Bharathi Puthakalayam. The bookstore and publishing house has links with the CPI(M). An official of the "squad" referred to a letter on a plain paper with no official stamp directing the publishers to cancel the release of the book. The "flying squad" said the book was a violation of the Model Code of Conduct in place for the upcoming national elections. As the images went viral on social media the Tamil Nadu Chief Electoral Officer had distanced himself saying, "Regarding the seizure of books, neither the ECI nor the CEO's office had given any instructions. I have directed DEO (district electoral officer), Chennai, to look into and give his report immediately." The publishers feel it's an attempt to intimidate them ahead of elections. Mr Rajan added, "We have published several books around elections over the years. Recently we had published books on Sterlite issue, Hydrocarbon and Koodankulam nuclear issues". The information the book has is already in public domain, largely revealed by The Hindu. It's in simple easy to understand style in Tamil." Nagarajan, the publisher added, "We will not be cowed down. We don't ask readers to vote for a particular party. In public interest we explain issues in simple language. This will only motivate us to do more". The booklet, priced at Rs 15, compiles reports on the Rafale jet deal and allegations of corruption and crony capitalism, including investigative reports by Veteran journalist and Chairman of the Hindu Group N Ram. At the book launch, Mr Ram said, "Under which rule they seized the books and asked them to cancel the book launch? Is it democratic? Can't people discuss Rafale issue ahead of elections?